At session 2 of Wet ‘n Wild we did part 2 of the family dyeing. I am really pleased with the palette of cloth that this created; golden yellow, violet, purple, dark brown, twelve related colours in total. The rest of the session was taken up with tray dyeing. 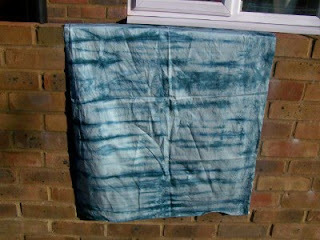 For my single colour tray dyeing I used petrol blue and pleated the fabric. Here it is rinsed and dried. There is quite a lot of white left and I think I am going to over-dye it. 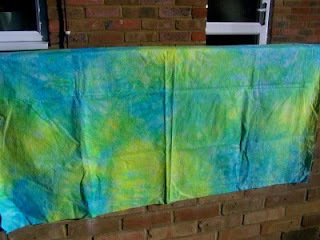 For my dual colour tray dyeing I used acid yellow and turqoise to generate multi-coloured fabric with textural marks. Here it is rinsed and dried. My sister says it looks like material from a wedding dress from “My Big, Fat Gypsy Wedding”. I call it ‘Bondi Beach Towel’. 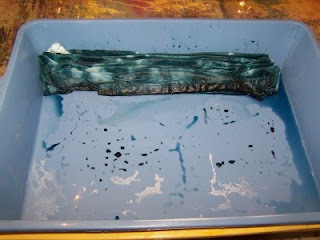 I am definately going to either over-dye it or re-dye it in a tray. 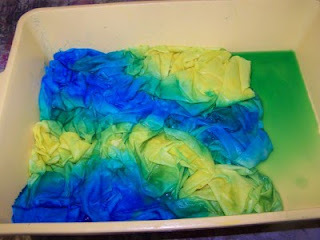 So, I am off to soda soak my fabric. 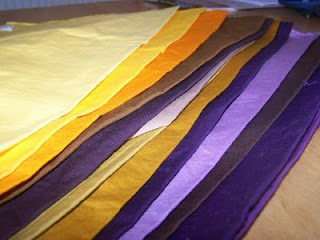 Great colours Melanie,can't wait to see what you make from the material!